With the elegant detail of the turned canonball posts and the flowing curves of the headboard and slats, our Amish Sierra Crest Bed is the prefect Early American style centerpiece to incorporate into your decor! 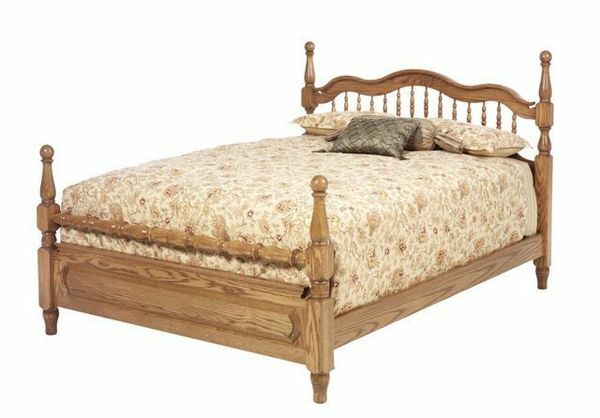 Preferred by many in a solid Oak or Quarter Sawn White Oak, with a light finish, our Sierra Crest Bed will serve as a beautiful representation of Colonial furniture and transform your space into an inviting oasis! Enrich your bedroom suite with the natural beauty our of handcrafted Amish Sierra Crest Bed! We offer our Sierra Crest Bed in an array of North American hardwoods, with a variety of finish options to fit any decor! Available in a range of sizes, from Twin in California King, you can customize the perfect bed to suite your unique space! Call one of our experienced furniture specialists today to answer your questions or to start your order by phone. We offer stain samples for all of our beds, so you can be sure that the hardwood and stain combination is perfect for your decor!